Do a sidewalk chalk art outline of a friend and then color in some funky clothes, hair, etc. You can also make other outlines by drawing or by tracing images. Kids can trace shoes, hands, feet, your jacket, your schoolbag etc..
Have fun creating your own chalk creations. In this video we explore how easy it is to come up with original sidewalk art. 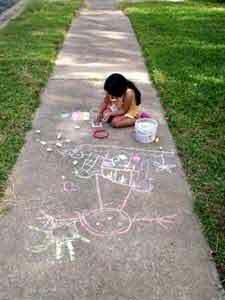 All you need is some colored sidewalk chalk and a volunteerfor your outline, or you can even trace different objects.